"Glad to have found the product I need!" 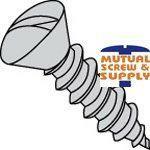 Can't find the fastener or product you are looking for or need more information about our '18/8 Stainless Steel Slotted Oval Head Type A Sheet Metal Screws'? Call us today or click the quote button above.